215 pages | 7 B/W Illus. The success of a Lean manufacturing program depends far more on organization-wide leverage of Lean manufacturing tools than it does on the tools themselves. To this the organization must add the human relations aspects that earn buy-in and engagement by all members of the workforce, to the extent that workers will react immediately and decisively to the presence of waste. The synergy of the human and technological aspects of Lean form what Henry Ford called a universal code for the achievement of world-class results in any enterprise, and which he put into practice to deliver unprecedented bottom line results. This book expands upon and systemizes this universal code into a structure or framework that promotes organizational self-audits and continuous improvement. The book's first section offers a foundation of four simple but comprehensive Lean key performance indicators (KPIs): waste of the time of things (as in cycle time), waste of the time of people, waste of energy, and waste of materials. The Toyota Production System's seven wastes are all measurable in terms of these four KPIs, which also cover the key metrics of Eliyahu Goldratt's theory of constraints: throughput, inventory, and operating expense. The first section then adds a proactive improvement cycle that sets out to look for trouble by isolating processes for analytical purposes and measuring and then balancing inputs and outputs to force all wastes to become visible. It is in fact technically impossible for any waste of material or energy to hide from what chemical engineers call a material and energy balance. Application of this book's content should therefore satisfy most provisions of the ISO 14001 environmental management system standard and the new ISO 50001 energy management system standard. 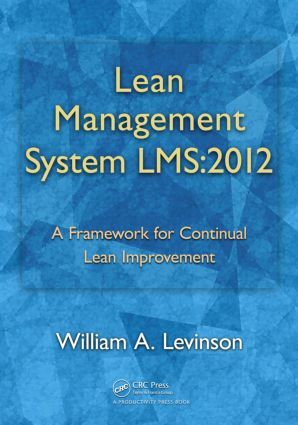 The second section consists of an unofficial (and therefore customizable) standard against which the organization can audit its Lean management system. The unofficial standard is designed to be compatible with ISO 9001:2008 so internal auditors can assess both systems simultaneously. Each provision includes numerous examples of questions that promote audits in a narrative form as opposed to yes/no checklists or Likert scale ratings. The unofficial standard can also be downloaded (without the assessment questions) from the publisher's Web site. The third section elaborates in detail on the second and provides numerous real-world examples of applications. Lean, Six Sigma, or Both? William A. Levinson is Principal at Levinson Productivity Systems in Wilkes-Barre, Pennsylvania, USA.